Check out my newest record! Come listen to FOG brass band at the Rex every Monday in May 6:30pm-8:30pm. 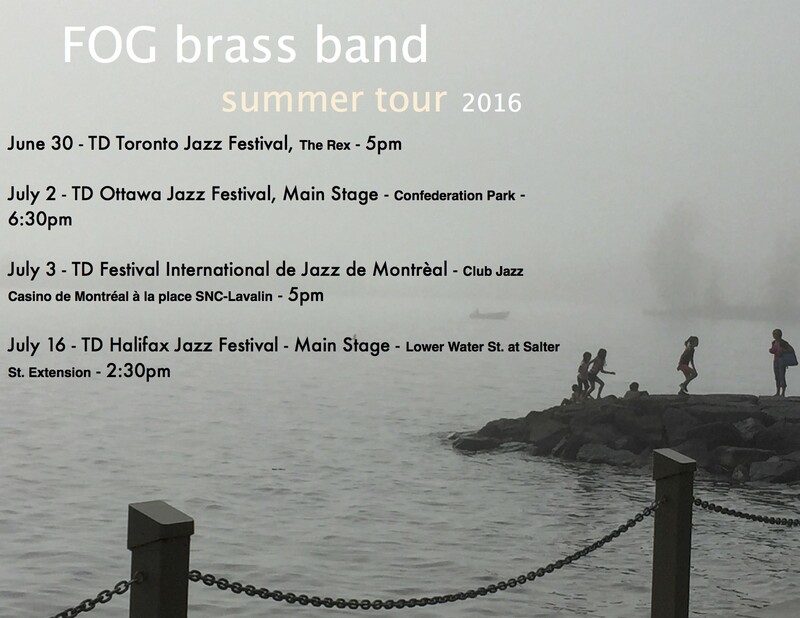 I am very excited to announce that FOG brass band will be playing the TD Toronto, TD Ottawa, TD Festival International de Jazz de Montreal and TD Halifax Jazz Festivals this summer. After our Jazz Festival tour, we will be spending two full days at Canterbury Music Company to record our first full-length recording with the support of the Canada Council for the Arts. FOG brass band at the Somewhere There Creative Music Festival! Somewhere There started up in a Parkdale loft back in 2007, but the Toronto-based arts collective is now turning nine and ready to present another instalment of its annual music festival. Now in its fourth year, the Creative Music Festival will take place from February 26 to 28 at the Tranzac. Things kick off on the evening of February 26 with performances from Ronley Teper’s Lipliners, SlowPitchSound and a new quintet formation led by Nick Storring. February 27 boasts solo improvisational sets from Germaine Liu, Paul Newman, Kyle Brenders, Peter Lutek, Ken Aldcroft and Nicole Rampersaud, while the evening will hear the Kyle Brenders Ensemble, the Ugly Beauties, the Polka Dogs and Interstellar Tentet. Finally, on February 28, the weekend-long event will wrap up with a set from Laura Swankey, Christine Duncan and Daniel Oore’s recently formed trio, alongside the Humber Composers Collective. The evening portion will see FOG, Ways and THREADS take the stage. In addition to live music, there will also be talks to attend and a mini record fair. You can find full festival information, including additional information about the performers, ticket prices and pick-up locations, and day-by-day schedules here. FOG Brass Band will be playing a concert at St. Andrew’s By The Lake Church on Toronto Island on Sunday, October 4th from 3pm-5pm. Here is the FACEBOOK EVENT for more info! FOG is a New Orleans Brass Band party with the intricacies of a modern jazz sextet. This band features a brassy frontline of tuba, trombone and trumpet that will have your toe tapping and your body grooving alongside energetic electric guitar, rich piano harmonies and deep drum beats that will take you through sounds inspired by funky blues, old country, Balkan and high-energy modern jazz. Maya Killtron is a powerhouse vocalist, writer, violinist and DJ who quickly gained national attention for her provocative, tongue and cheek debut record – Hipster/Gangster EP. Her single, Magnum Force was nominated for Who’s Got It Next at the Stylus Awards – Canada’s National DJ awards. She was quickly snapped up as a featured performer and DJ at festivals across Canada and the U.S. including Winter Music Conference in Miami FL, Pride Toronto and NYC’s CMJ Music Festival. 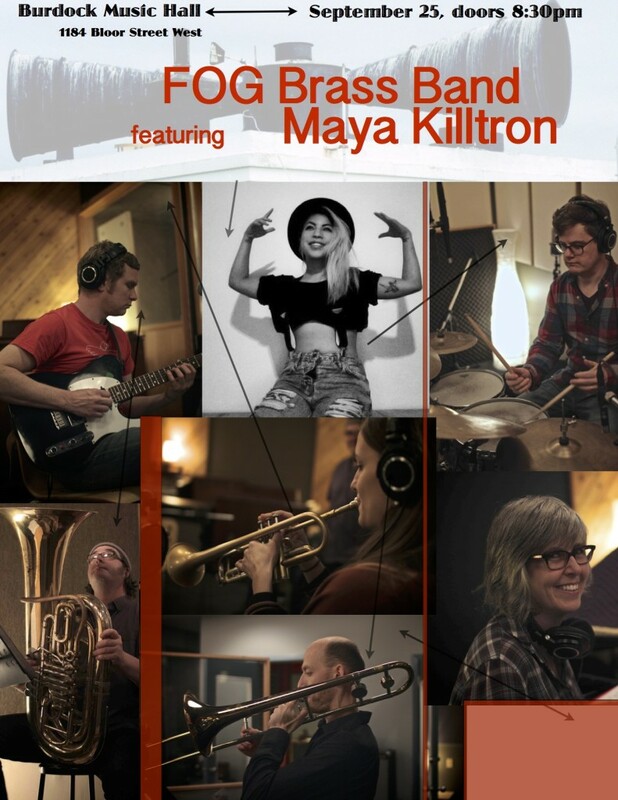 This collaboration between FOG and Maya Killtron will be an unforgettable night with FOG Brass Band as Maya Killtron’s backing band to perform her produced tracks live at Burdock Music Hall.